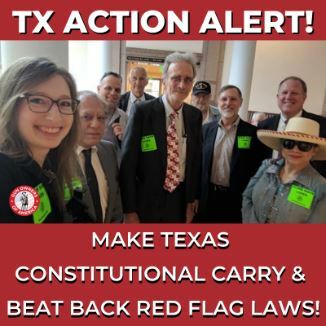 The Texas legislative session is in full swing, and we have until May to pass Constitutional Carry and stop “red flag” Gun Confiscation orders. I’ll be honest: this session may be grueling for gun rights. The chairman of the committee that traditionally listens to our bills is famous for hating Constitutional Carry and trying to shut down gun activists. Needless to say, I’m working hard — but I can’t do this without your help. 1. Come to committee hearings. Did you know that a committee hearing is the one time the Texas Legislature invites the entire state of Texas to show up and give their opinion on record on each issue? That’s right — and you are the one most qualified to give your own opinion to them. Most bills that fail to pass never even get a vote — they just die in committees. So, our biggest focus will be on the committee process, making sure enough of us show up and speak out. The other side always shows up in full force. We need to be stronger than they are. Please plan now to show up for committee hearings. We might have only 3 days notice. I know it’s a long drive to Austin for some of you. Now is the time to be planning your carpools and be prepared to take off work if at all possible. I cannot stress how important it will be to have you in the room. If you’re nervous about testifying at a committee hearing, check out my activist resources or attend a training event when I’m in your area. 2. Call or email legislators. A flood of phone calls or emails can motivate committee chairmen to schedule a bill for a hearing, or to ask committee members to vote favorably. I have seen miraculous changes in legislators after sending out an action alert and having activists shut down their phone lines with requests for action. Please pay attention to our action alerts and take a minute to make that phone call or send that email when we ask you to. 3. Connect with us — and spread the word! How are you going to know when to show up or make phone calls? Stay connected with GOA! If you are receiving this as a forward, you can subscribe here. Also please follow us on Facebook, Twitter, Instagram and YouTube. If you’re already connected with us, please take the next step: help spread the word to more people! 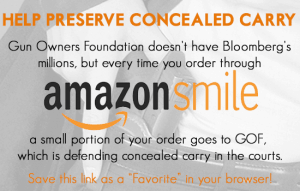 Forward these notices to your gun clubs, political groups, or other friends who can help support this cause. Please don’t forget — I’m counting on you to show up and speak up so we can protect liberty in Texas. I’ll see you in Austin!